Pretty Purple Stud Box it looks fantastic and presents all our Stud Earrings Beautifully helping to increase your Sales. 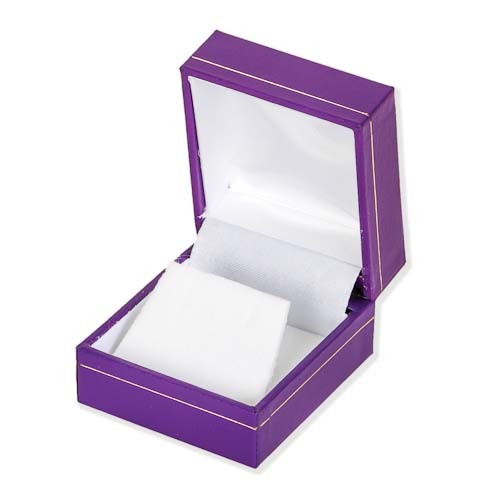 This Pretty Purple Stud Box has a Hinged Lid with a lovely white flock inner which sits up at an angle to display your Jewellery. This Pretty Purple Stud Box looks fantastic and presents all our Studs Beautifully so it really helps to increase your Sales. This Pretty Purple Stud Box has a Hinged Lid with a lovely white flock inner which Stands up at an angle to display your Stud Earrings. It is 46mm wide by 51mm long & 36mm deep. This website is strictly for approved Wholesale customers only, if you are looking to buy this Pretty Purple Stud Box from a retail store, please visit Shooting Star. Hand Made Turquoise Marquise Earrings. These Silver Turquoise Marquise Earrings have Pretty 14mm x 8mm Marquise Cabs which are set a in Silver Colet. Approx 3 1/2cm incl Hooks. Nice hand made Mystic Topaz Small Oval Earrings. These Lovely Mystic Topaz Small Oval Earrings have beautiful 14mm x 10mm oval cabochons which are full of rainbow colours & they are just under 3cm long including hooks. BEST SELLER! Lovely Dainty Dreamcatcher Earrings. These Beautiful Dainty Dreamcatcher Earrings have a Pretty Turquoise Bead in the center & a Small Silver Detailed Feather which hangs down from the bottom centre. They are finished with a very high polish so they look stunning as you can clearly see in the photo. They are approx 1cm x 4 1/2cm Incl hooks. Matching Necklaces are also in stock. BEST SELLER! Hand Made Rainbow Moonstone Dainty Oval Earrings. Lovely Light weight Silver Rainbow Moonstone Dainty Oval Earrings they are set with Pretty 10mm x 8mm Cabs. Approx 1 1/2 cm excl hooks. BEST SELLER which is also in stock in many other crystals! Hand Made Black Onyx Double Drop Earrings. These are Beautiful Silver light weight Black Onyx Double Drop Earrings. These Lovely Large Dangling Earrings have Pretty 9mm x 7mm Oval Cabs at the top with 9mm x 7mm Inverted Teardrop Cabs Below. They are set a in Pretty Light weight Silver Setting which frames the Crystal. Approx 4 cm incl Hooks. Lovely Labradorite Triple Drop Earrings. These Are Beautiful Hand Made Sterling Silver Labradorite Triple Drop Earrings. Simple silver work surrounds four Pretty Labradorite Cabs. In the center at the top is a 10mm by 8mm Oval Cab set sideways & from here three 5mm x 8mm Inverted Teardrop Cabs Drop down. Approx length 3 cm excl the hooks.